No Man’s Sky’s NEXT update dropped this week, and people are owning the sky. They’re commanding freighters and scooting ships around the galaxy. 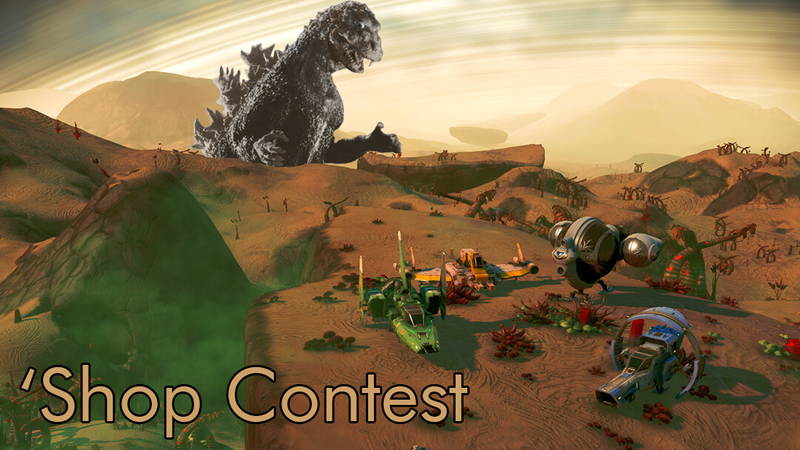 But deeper evils exist, and this week’s ‘Shop Contest is about finding them. I want you to ‘shop me up some cosmic terror. The core of movies like Alien is that the characters have gone to a planet, they’ve done some stuff they shouldn’t have, and then they’re punished for their hubris. I want you to create some moments in No Man’s Sky where people are experiencing that exact punishment. ‘Shop your favorite Disney villains into the landscape. Is the space station full of Terminators? Is Shroud there headshotting all who appear in his domain? Has the Far Cry 5 cult established a space base? Let your imagination run free with all of the weird, bad things that can appear in space. If you want to make something like what I made above, here’s the clean version of the screenshot that I altered (although you’ll have to do your own cutout), and there are lots of easily ‘shopped images on the official No Man’s Sky website. 1. Create your ‘Shop and save it to your desktop. Images must be at least 636 pixels wide. 4. Alternatively, you can upload the ‘Shop to a free image hosting service. I suggest imgur. Then paste the image’s URL into the field that says “Image URL.” Note: this must be the URL of the image itself, not the page where it is displayed. That means the URL ends in .jpg, .gif, .png, whatever. 5. Add editorial commentary and hit submit and your image will load. If it doesn’t, upload the image to imgur and paste the image URL as a comment. I will look at it. 6. Large-size images may not upload properly, though we have seen some animated .gifs upwards of 5 MB. If you’re still having trouble uploading the image, try to keep its longest dimension (horizontal or vertical) under 1000 pixels, or the whole thing under 2 MB. &apos;Shop Contest: Exposing Captain Toad&apos;s Crimes, Winners! &apos;Shop Contest: Palpatine Deserves To Be Everywhere, Winners! &apos;Shop Contest: Create More Fortnite Mysteries, Winners!